It’s just about midnight! No, I didn’t slack off on making my artwork today. Rather, my internet was down for almost the entire day. It’s interesting when that happens though, mainly because you kind of forget how our lives revolve around internet use. 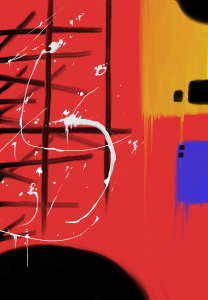 I wasn’t able to listen to the usual online radio stations, watch Netflix, get into my website (or any website) and while I was able to get something like 85% of this digital painting complete while my internet was down, I really wanted to look up some abstract paint splatter artwork to see how realistic I could make mine. Speaking of this, it turned out pretty well. This painting was what I started out with in yesterday’s drawing on paper. I still want to add a little more, without over complicating the picture as a whole. One idea is adding some more of those pixel-like cubes on the edge of the virtual canvas. I think that would probably be all it needs. Alright, so it’s after midnight, and I’m pretty tired. I’ll mention one more thing before I get this posted and call it a night: I have plans to add a “Store” link on the bar at the top of my website. Most likely right next to the “Leave tip” link. I’m thinking that I’ll have that link lead to a page within my website with more links (hopefully that’s not annoying) each leading to the various stores where my artwork is for sale online. I think that’s a fantastic idea (which was an idea suggested to me a couple day ago) because it’s not like it’s taking up main real estate or moving any content around. No downside. I like it. It shall be done. Good night!